LTI stands for Learning Tool Interoperability. Historically, external tools have been built to operate within a single learning platform. This creates a functionality problem as users are not able to access the best tools to teach or learn the provided content. LTI enables a single tool to be utilized across many different platforms. In Sublime LMS, LTI is referred to as External Applications. 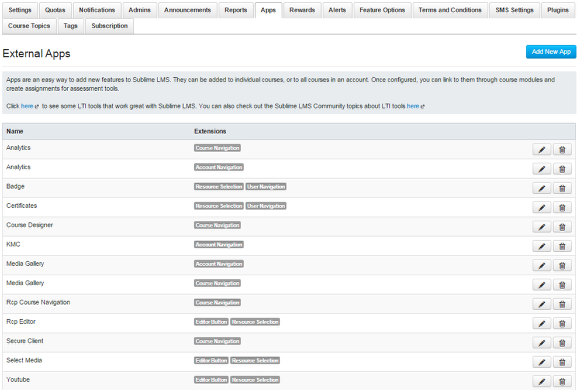 Note: LTI should be used to configure existing tools into Sublime LMS. Third-party developers should refer to the API LTI documentation for an an overview on how to develop a tool for Sublime LMS since external tools can be configured through the API. LTI provides a framework through which an LMS (Sublime) can send some verifiable information about a user to a third party. For LTI to work, the third party needs to provide a consumer key and shared secret that Sublime LMS can use to generate a signature to verify the authenticity of the data sent. 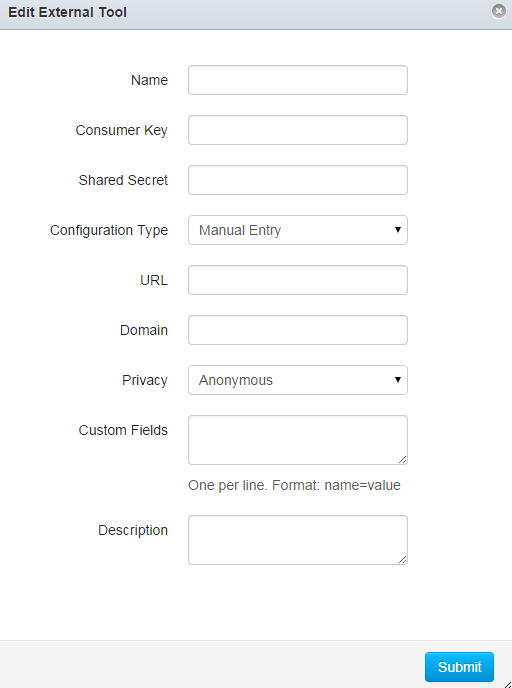 By default most user information is anonymized, but this can be changed when the configuration is first set up. External Apps can be configured on the account or course level through URL, XML, or manual entry. When would I use an External Application? External Applications add functionality to a Sublime LMS course. For example, an instructor may want to include a study aid (flashcards, mini-quizzes, etc.) to help students better understand the concepts being taught. An instructor can locate an LTI compatible tool and align it within the context of the course providing additional learning paths for students. Applications can be added to Modules, Course Navigation, the Rich Content Editor, and Assignments.